Some people might say that all tote bags seem the same, but that's definitely not the case! There are lots of different designs to choose between and when you are looking for a new tote bag, you not only need to look at the designs. You also need to consider the different sizes, features and qualities (which can vary a lot from brand to brand). 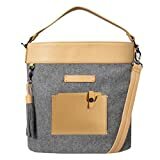 Having checked thousands of tote bag reviews, we can say that the Michael Kors Mott is the best choice for most people. The Michael Kors Mott got a rating of 4.70 out of 5, while the average rating in the list below is just 4.00. This is the best reviewed tote bag. We have checked 119,146 tote bag reviews, so we can show you the weighted average rating of all the bags. If the Michael Kors Mott isn't your style, you might also consider the Michael Kors Newbury. The Newbury is a close runner-up with a rating of 4.70 out of 5. The second-best reviewed tote bag. Finally, you might consider the Sherpani Boheme. The Boheme is the third-best rated tote bag with a rating of 4.62 - and it's most often cheaper than both the Mott and the Newbury. The third-best reviewed tote bag. Below is the list of all top 134 best tote bags. Great if none of the three bags above are your style. PS: We have checked 119,146 reviews to make this top 134 list! Tote bags are arguably one of the mostly commonly utilized bags across the world. This is largely because these bags have a number of uses, making them a good fit for many different environments and situations. Of course, this does depend on the type, size, design, and material of the tote that you get. Since it is difficult to find a bag that fits everyone, you will need to figure out which one is best for you. Since there are a number of factors that come into play when making this decision, we have taken all of the hard work out of the process. All you need to do is refer the guide that we have put together and that contains all of the information that you should know about totes. When it comes to casual bags that are carried by hand, a certain amount of confusion ensues. This is often because many terms are used interchangeably or there isn’t a clear definition of one type of bag. As you can imagine, this can make your task of finding a good tote bag even more difficult. The two types of bags that are most commonly mistaken for one another are tote bags and handbags. This is because they look quite similar and in many places, the names are used rather fluidly. Despite this, there are actually a few differences between to the two. To start with, tote bags tend to be a bit more unstructured than handbags. This means that the bags often can’t stand upright when empty. Also, while this isn’t a hard and fast rule, tote bags are typically a great deal larger than most handbags. This is because one of the main functions of a tote bag is to allow you to carry a large number of items. Not to mention, tote bags tend to lack compartments. Instead, there is just one large space where you can arrange your items. Handbags, however, have segmented sections, compartments, and pockets. Since tote bags have evolved quite a bit, not all of the bags necessarily lack proper closing mechanisms. Nonetheless, many of these bags do. Handbags, though, always have features that allow you to close the bag up tight. This is perhaps one of the more recognizable types of tote bags. In fact, these increasing in popularity as people are gaining interest in reusable, eco-friendly bags. Grocery tote bags prevent the use of disposable plastic bags when you go home with your groceries. A laptop tote bag is a bag that contains a specialized compartment for most electronic devices including laptops and tablets. These compartments are often padded to protect the devices from shocks and bumps. If you are choosing this type of bag, you will need to check that the compartment is large enough to hold your laptop or tablet. Another place that you are likely to see tote bags are at the beach. The main draw of these bags is that they are quite durable and can withstand being exposed to the elements for long periods of time. In most cases, they also tend to be water resistant. Although this type of tote bag isn’t as common, they do work quite well, particularly for airlines. Of course, these bags do have a bit more security features than most others. They also tend to have a few compartments and pockets as well. What are Tote Bags Made Of? Tote bags are actually made from a wide variety of materials. Since they have so many uses, you will need to find one that is made from fabric that is relevant to your requirements. You will probably not be too surprised to find that canvas tote bags are one of the most popular kinds of bags around. One of the standout features of canvas is that it is quite strong and durable. Therefore, it is capable of easily carrying a heavy load without tearing. These bags are also easily painted or printed on which is why you will typically find such brightly colored and patterned styles. Due to its strength, this material can be a bit heavy. So, canvas tote bags may have some weight to them, even when empty. Cotton tote bags are also common enough. While they don’t boast the same strength as their canvas counterparts, they do have the benefit of being quite light. This makes them ideal for small shopping trips or for lightweight items. Of course, this means that cotton tote bags aren’t necessarily the strongest option around. Then, there are jute bags which are now in big demand. Jute is a thread that is made from vegetable fibers and is, therefore, quite environmentally friendly. These can be used as chic tote bags although they are more typically found as grocery bags as an alternative to plastic disposable bags. You will also be able to find a leather tote bag or two if you look hard enough. The main purpose of these bags is fashion. They look quite trendy and luxurious although they can be a bit difficult to maintain. These bags customarily can’t hold as much as some of the other tote bags. For everyday use, you will come across tote bags that are made from nylon. This material is strong, relatively lightweight, and can even be water resistant if it has been coated with polyurethane layer. If you need a stronger bag, there are some available in ripstop fabric which prevents the bag from wearing down. The most basic tote bags don’t actually have any fasteners at all. This means that the bag is left open. The advantage of this is that you are able to pile in a greater number of items into the bag. Now, this works well for groceries and if you are traveling in your own vehicle. However, if you will be going about in public or want to ensure that your belongings are kept safe, then you are going to need a tote bag with a fastener. This, of course, leads us to the type of closures that you can expect. One of the most common (and sturdiest) options are zippered tote bags. While these prevent you from packing too much into your bag, they are also useful for making sure that everything stays in. It is best to look for a zipper that goes all the way across, from one end of the bag to another. Some of the tote bags have magnetic tabs on either side of the opening of the bag. They are typically placed in the middle so that they tabs can effectively hold the bag closed. The benefit of this type of fastener is that it is easy to open and close when you need to take something out or place something inside the bag. However, this may not be the most secure option as there is a chance that items may fall out. Tote bags are available in a variety of capacities and sizes. There are even micro options that can hold around 5 liters or less. These, however, don’t serve all that much purpose. You will find that most tote bags are of medium sized. This means that they can carry between 10 and 25 liters worth of items inside. The larger bags can accommodate up to 40 liters at a time. With tote bags, you have to keep in mind the balance between capacity and how much weight that each bag can carry. Considering the construction of the tote bag, there is a limit to the load that these type of bags can carry. Not to mention, because of the carrying system, it can be difficult for you to carry around a greater weight as well. So, just because you opt for a large tote bag doesn’t mean that it can contain a considerable weight. Now, as mentioned, some tote bags can be used for travel purposes. This means that you can take it on the flight with you. Of course, this is provided that the bag adheres to the rules set down by the airlines. In most instances, your tote bag can’t be longer than 22 inches, wider than 14 inches, and have a depth that is greater than 9 inches. To be completely sure that your tote bag is right for travel, though, you will need to check with your specific airline ahead of time. The fun thing about tote bags is that now, they come in a variety of colors and patterns. It is quite easy to make a fashion statement which means that you don’t need to settle for a boring style, even if it is to be used as a grocery bag. You can instead go with something bright and bold or muted and classic. If you are all about packing as much as possible into your tote bag, then you should be looking for one with an expandable option. This way, you will be able to get additional capacity out of your bag, depending on the occasion. If you want to carry groceries or snacks for a picnic in your bag, you may want to consider one with insulation properties. This will ensure that your hot and cold items will remain this way until they are taken out of the bag. So now you know everything that you should about tote bags and the factors to consider when choosing one. Classic tote bags and models that haven't yet got enough reviews to be ranked. List ID 28. Images from Amazon Product Advertising API and shop datafeeds.